This Greek Pasta Salad is so easy to make and can be ready in 25 minutes. With cucumbers, tomatoes, feta cheese, and olives, this Greek salad is bursting with flavor. Serve it as a main dish with grilled chicken or as a delicious side dish. what is the best pasta For pasta salad? We are often asked what is the best pasta to use in our various pasta salads. We like to use pasta that is bite-sized. It’s easier to fit into your mouth and less messy if you have a dressing on your salad. Our favorite pasta to use in most of our pasta salads are bow tie, elbow, and rotini. We like the dressing to get into all the crevices of the pasta, which adds more flavor to every bite. We do have a few pasta salads that ask for spaghetti noodles (like our popular Spaghetti Salad), and that is because it is specifically a spaghetti noodle salad. Know that if you were out of pasta and only had spaghetti noodles on hand, they would work great. how long will pasta salad keep in the fridge? First, we need to tell you that we love leftover Greek pasta salad. It’s almost better on the second day because all of the flavors have fused together. Every bite is full of so much flavor. Greek Pasta Salad can easily be stored in the fridge for 3 to 5 days and still taste great. We store pasta salad in an airtight container. Just pull it out of the fridge, give it a good stir, and enjoy it again. what can you add into pasta salad? All of the add-ins make this pasta salad burst with beautiful colors. Bring a pot of water to boiling and add in the bow tie pasta. Cook according to directions on the box. Cook until tender and then drain and run under cold water in a strainer. Drain and let cool while you prepare the rest of the recipe. Cut up the vegetables as directed in the recipe directions. In a large salad bowl combine the cooked and cooled pasta along with the cucumbers, tomatoes, feta crumbles, olives, and red onion. Add in the Greek salad dressing and toss until all is coated well. Top with shredded Parmesan cheese. We like to serve this salad cold. If you love Feta cheese, you can always add a few more crumbles to the top of the salad. This salad goes great with any meat. It’s perfect for a BBQ or when the family is all together and you need a big salad to feed a crowd. Have you heard about our latest cookbook, Copycat Cooking? We took over 100 of our favorite restaurant recipes and simplified them so that you can make them right at home! We love pasta salads because they come together so quickly and are EASY to make. 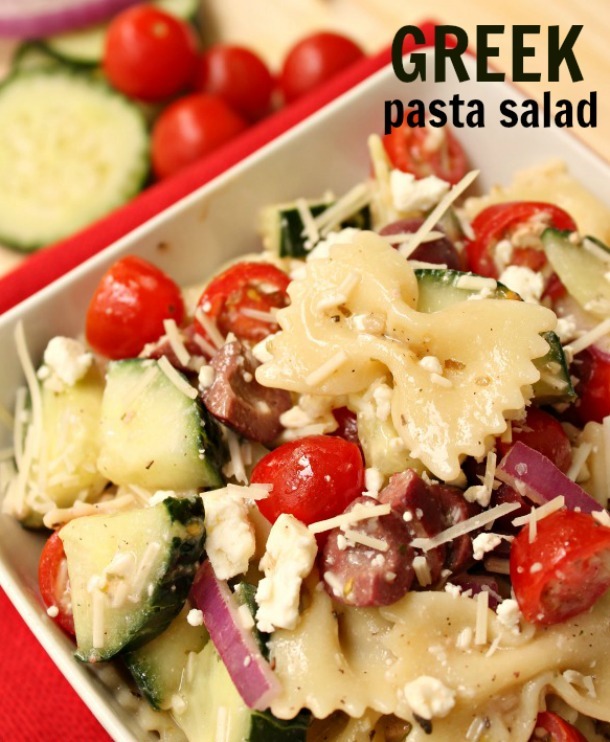 Your family will love this tasty Greek Pasta Salad. Perfect for your summer cookout! Cook pasta according to package directions just until tender. Drain pasta and run cold water over it. Drain well and and let cool while preparing the rest of the recipe. In a large bowl combine cooled pasta, cucumbers, tomatoes, feta cheese, olives, and onion in a large bowl. Add Greek dressing and toss until well coated. Top with shredded parmesan cheese. This is delicious served cold.